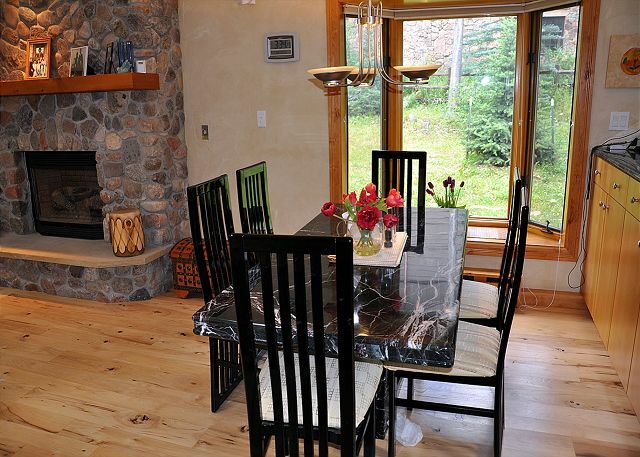 Beautiful Creekside East Vail Home #4074. Close to shuttle stop. 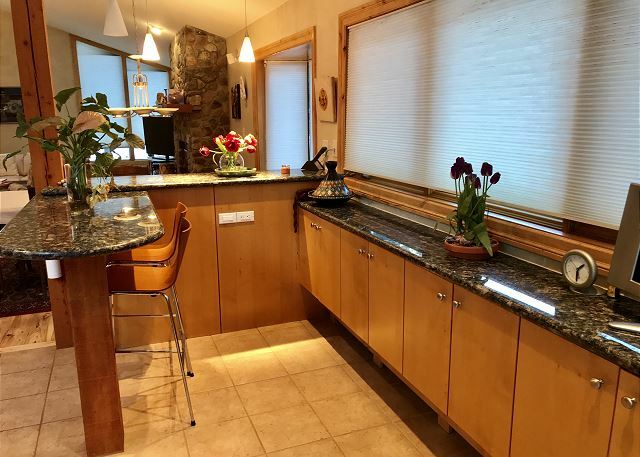 Managed by Gore Creek Properties, this beautiful gold rated home is 1500 square feet and is located in a lovely setting in East Vail, directly on the Gore Creek. It is just 4 miles from Vail village. The home has 3 bedrooms and 3 bathrooms and can accommodate up to 6 people. 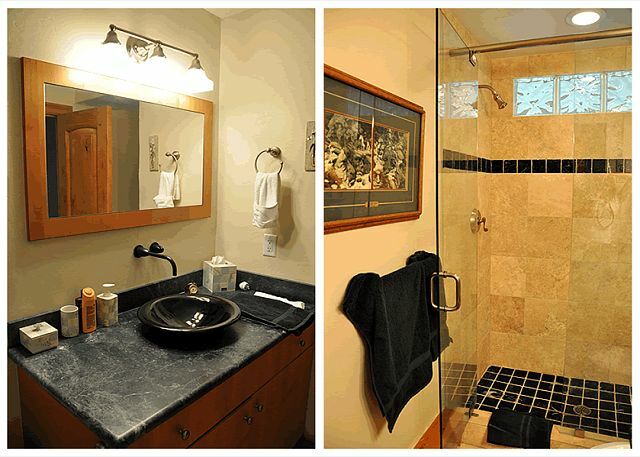 It has a lovely granite top kitchen and a large gas fireplace in the spacious living room. 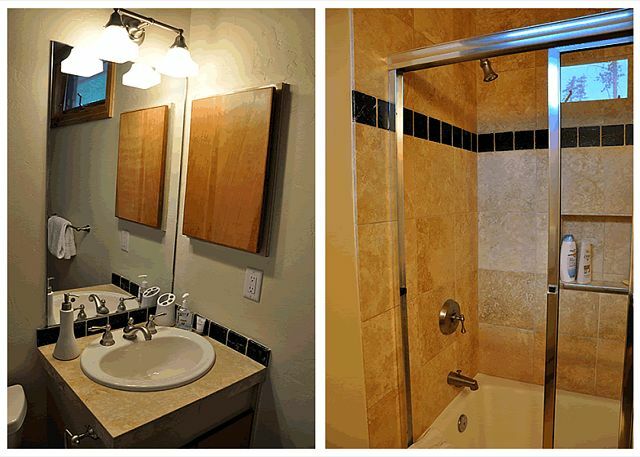 There are wood floors throughout the living area and the bathroom in the master bedroom has a unique glass-brick shower. 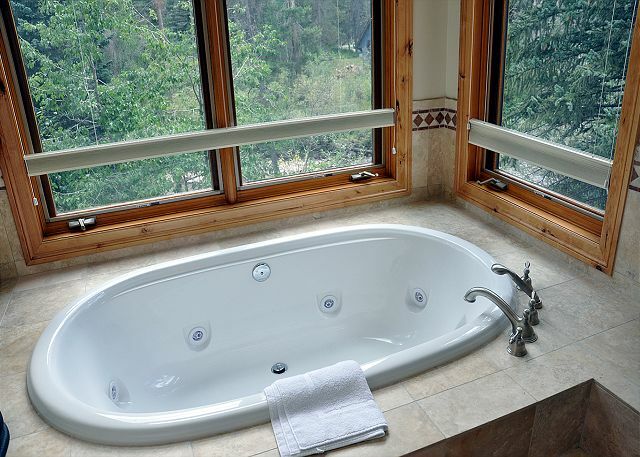 There is spacious deck overlooking the stream and a new private hot tub. The free shuttle stop for the bus which runs every 15 minutes into Vail is right by the house. There is room for 2 cars to park in the driveway. Come spend your vacation in this home and you won’t want to leave! This property does not allow any pets and is NON SMOKING. 4 wheel drive recommended or adequate snow tires as the driveway is steep. The house and location were great. Just two doors down from the bus stop. The only issue was the upstairs was very warm in terms of temperature even with the windows open and the heat turned off. Overall I have to say we are satisfied with our choice , the location and the size of this house was perfect for us, the kitchen is awesome very airy and beautiful views. The only thing i didn't like was the coffee maker was old and I had to wash it twice to be able to use it, also I was surprised not to see a kettle there!! Everyone drinks tea these days- I used a pot to boil water:) an electric kettle would be great. I have to add one more thing , there are too many family pictures every where in the house, somehow it didn't feel right!! We loved the hot tub & the master bedroom jacuzzi, the shuttle service is so in time and convenient. We had to stay two more night because of the snow storm and Terry was so accommodating. Thanks and we will defiantly come back. What a place! 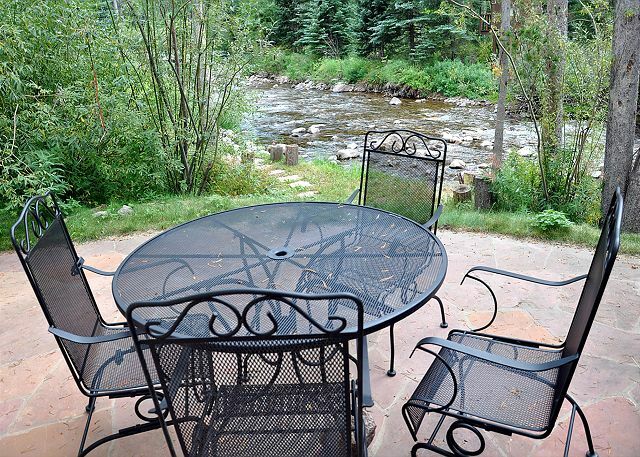 Awesome location in East Vail on the beautiful Gore Creek. 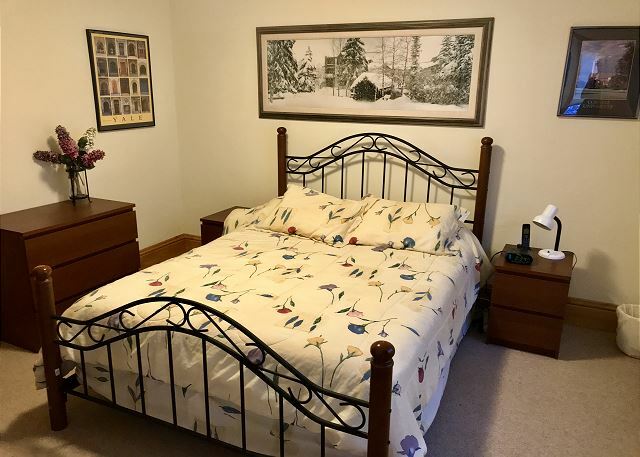 Bedrooms and bathrooms are excellent. Gourmet kitchen with Viking range. On the bus route a few steps out the door. And last but not least, an excellent hot tub right next to the creek. We will definitely be returning! Spacious and bright. Well supplied kitchen. Steep driveway (you'll need 4wd to get out in the winter). Close to bus stop. Never really needed any assistance from Gore Creek Property staff. All went very smoothly. House was in good condition. Some closets, kitchen drawers and the kitchen pantry were not clean and were cluttered with the owners items. One of the sofas in the living room seemed quite old. Overall we enjoyed our stay. Wonderful Stay!! Great to work with as well! 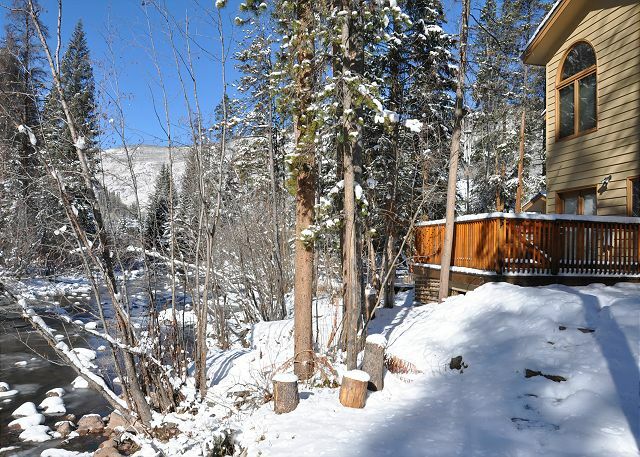 Gore Creek Properties is very nice and easy to work with. Very helpful in every way and made our stay an excellent experience. The property was great and very convenient. We would definitely come back and stay.